There are many additional goodies in The Vault, including a book containing over 50,000 words and 160 photos from Gene’s personal collection. There’s also commentary on every track. The Vault itself is very sturdy and handsome (like Gene himself) and has wheels to easily roll. During The Vault Experience, Gene discusses his life and influences while playing an acoustic guitar. His great love for The Beatles, for being both being musically innovative and very cohesive visually, is a key topic. Other favorite bands and songwriters were spoken about as well, such as The Kinks and particular their song “A Well Respected Man”. Gene, like the other members of KISS, is an anglophile, and is especially influenced by British bands. This was very much so when putting together the ethos of KISS. Gene discussed the origins of vintage KISS songs, and noodled the licks and flourishes to several. He also noted that so many of these licks within KISS songs, including ones that aren’t credited to him, were his ideas. The very notion of ideas, i.e. intellectual property, is at the heart of this deeply personal collection of music from Gene. He put a great deal of time, effort and care into it. Gene noted that he wanted it released while he’s alive, and not to have it be done so by someone else posthumously. Gene also explained what he and KISS made an effort to avoid, such as the way bands or artists turned their backs to the audience or sat on a rug and were quite insulated seeming, such as Donovan. Gene and the other guys in KISS have always said that they were the band that they themselves wanted to see and hear. Also addressed was Gene’s playing style and point of view, which is to be melodic like his hero Paul McCartney, and that simply thumping along with the drummer, like AC/DC often does, isn’t his thing. Gene has always placed the importance of melody very high, and this is one of the prime reasons he loves the Beatles and groups that sing and play with great melody. Some that come to my mind, in random order, are The Bee Gees, The Righteous Brothers, The Everly Brothers, The Beach Boys, The Four Tops, The Temptations, The Byrds, The Mamas & The Papas, Crosby, Stills, Nash & Young and America. One of Gene’s strengths is that he has a wide variety of musical tastes and influences to draw from when writing songs, but makes them his own. A highlight of the day was having original KISS drummer Peter Criss make an appearance with Gene. 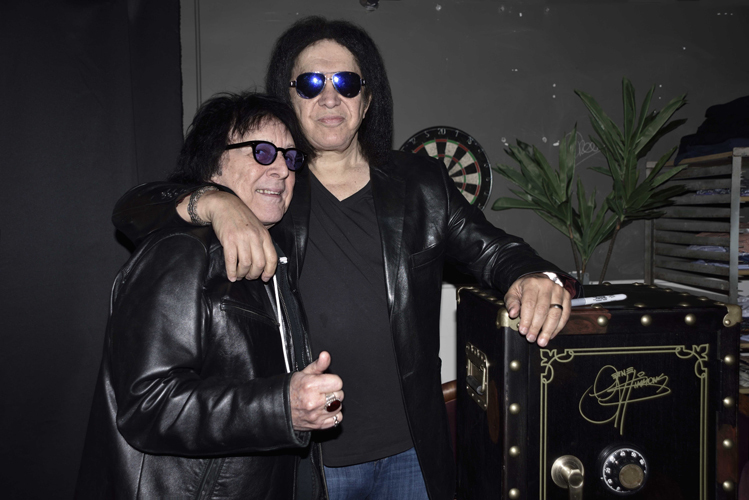 Peter said that he hadn’t seen Gene since KISS were inducted into the Rock and Roll Hall of Fame in 2014, and that it was important to him to visit Gene here. (Peter lives in New Jersey.) Peter said that he’s always had a special bond with Gene, and that they share a weakness for cakes and sweets. Peter and Gene hugged, and Peter then spoke for about five minutes. That was followed by he and Gene going to a private room where Gene presented Peter with a Vault. After Peter departed, Gene said that like any family, there will be problems and disagreements, and that Peter and Ace Frehley, KISS’s original guitarist, will always be family. Ace, by the way, has appeared with Gene on two stops of his Vault Experience tour. Gene said that he’d love for Paul Stanley to appear as well, but that Paul has declined so far.